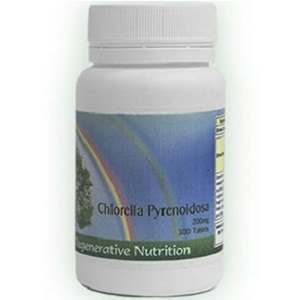 This 100% Chlorella supplement is meant to provide overall health support. Listed benefits include better-functioning immune and digestive systems, the removal of heavy metals and toxins from the body, anti-viral properties to reduce harmful bacteria while boosting beneficial gut bacteria, and support for oral health to reduce the number of harmful and odour-causing bacteria. Each tablet contains 200mg of 100% pure dried cracked cell wall chlorella, and is suitable for vegetarians and vegans. Cracked cell wall chlorella is chosen over ‘whole’ chlorella as it is more bio-available and can actually be digested in order to be processed in the cells. Chlorella is a freshwater algae which contains a large number of amino acids, vitamins, minerals, antioxidants, and chlorophyll. Some of the vitamins with the highest concentration in chlorella include vitamin A, vitamin B2 & B3, iron, magnesium, and zinc. It is known especially for its detoxification properties and has been shown to reduce the build up of heavy metals, like lead, that can accumulate in the body by carrying them through the digestive system for elimination. Regenerative Nutrition recommends 15 tablets daily for adults, 8 tablets daily for children ages 6-12, and 4 tablets daily for children 3-6. It suggests that these doses should be split up over the course of the day, 2-3 times per day, rather than all at once. As always, it is a good idea for women who are pregnant or breastfeeding to consult a professional before taking a new supplement. Because it can enhance immune functioning, those who suffer from autoimmune disorders may want to avoid this product as it could exacerbate symptoms. Chlorella contains high levels of Vitamin K and can increase clotting, so those taking clotting medications should speak with a doctor about this supplement and any interactions it may have. As it is a powerful detoxifier, dosage should begin low and slowly increase to minimize any adverse symptoms of detoxification like digestive upset and headaches. This bottle of 300 tablets costs $18.78 and available through the company’s website. The brand does not seem to be widely available online, but may be found in small local supplement or natural pharmacy stores. Regenerative Nutrition offers a full money-back guarantee, but with a number of restrictions. Returns must be received within 28 days of purchase, and with no more than 1/3 of the product gone. Returns are also in the form of a credit, rather than a refund in payment. There are no customer reviews for this specific product, but reviews for comparable products are positive and report increased health and vitality. The health benefits of chlorella are widely studied, and the high concentration and bioavailability of chlorella in this supplement makes it a strong choice for those looking to improve health. One main downside of this product is that it is not widely available off of the website. If taking the full recommended adult dosage of this supplement, one bottle will last less than one month, which can cause costs to multiply over time. The limited product guarantee for this product that refunds for store credit only is also a source of hesitation over other similar brands, but the lack of reviews for the specific product is the primary downside. Tim McClure	reviewed Regenerative Nutrition Chlorella Pyrenoidosa	on February 1st	 and gave it a rating of 3.